Fukuroda Falls (袋田の滝, fukurodanotaki) is one of the three great falls in Japan, and also one of the 100 best waterfalls in Japan. It is located at Fukuroda, Ibaraki prefecture. 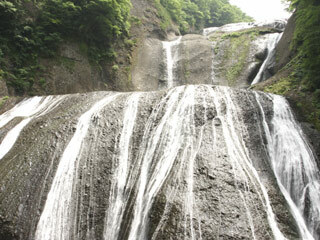 It is the most favorite waterfalls in Japan. It is 73m (244 ft.) width and 120m (400 ft.) high, 4 steps falls. In the winter, the fall will be frozen up, and at fall, you can see great autumn color around the fall. You have visit four times to see all faces of this beautiful fall.